Think of Nelson's Italian community and The Wood's tomato market gardeners spring to mind. But Italians have been making Nelson home since the gold rushes of the 1860s, when a thriving fishing community also established itself in the city. 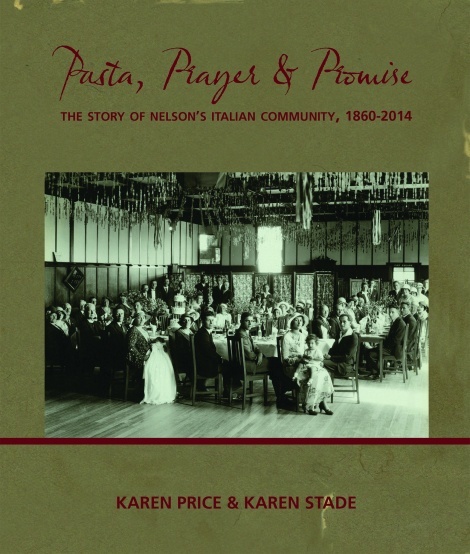 Tracing the chain migrations of the late 1800s though to the outbreak of World War II, Pasta, Prayer & Promise by Karen Price and Karen Stade tells the colourful story of a vibrant community. From the heartbreak of leaving family in Italy to joyful reunions in a new country, the book explores their reasons for leaving, how they arrived in New Zealand, the hard work required to establish themselves in a country half way around the world from Italy, and the establishment of Club Italia so they could preserve their culture and heritage. It tells of their despair at being termed enemy aliens in the second world war, the flood of post-war migration and the recent arrival of a new generation of Italian immigrants. With the individual immigration stories of more than 30 early families, this book puts the Italian community in the spotlight and reveals just how much it has contributed to the social and economic makeup of Nelson, including its importance to the nation's tomato industry, through scientific research carried out by the Cawthron Institute. Meticulously researched, lavishly illustrated with many previously unpublished photographs, and containing stories never before recorded, this is a book that celebrates all things Italian in Nelson. 448 pages, hardback with dustcover, full colour.